Han Solo and Leia Organa take center stage, and stunning revelations from the past play a critical role in shaping the future, as the New York Times bestselling author of Star Wars: The New Jedi Order: Star by Star now turns to a crucial chapter in the classic Star Wars saga. The deaths of Darth Vader and Emperor Palpatine, and victory at the Battle of Endor by no means spelled the end of the Empire. In the aftermath, the New Republic has faced a constant struggle to survive and grow. And now a new threat looms: a masterpiece of Alderaanian art—lost in transit after the planet’s destruction—has resurfaced on the black market. Offered at auction, it will command a handsome price . . . but its greatest value lies in the vital secret it conceals—the key to a code used to communicate with New Republic agents deep undercover within the Empire. Discovery of the key by Imperial forces would spell certain disaster. The only option is recovery—and Han, Leia, Chewbacca, and C-3PO have been dispatched to Tatooine to infiltrate the auction. Dangerous as the chase is, for Leia it leads into especially dark territory. Already haunted by the specter of her infamous father, and fearful that his evil may infect future generations, she has suffered a disturbing Force-vision of Luke turning to the dark side. As she battles beside Han against marauding TIE fighters, encroaching stormtroopers, and Tatooine’s savage Tusken Raiders, Leia’s struggle with the warring emotions inside her culminates in the discovery of an extraordinary link to the past. And as long-buried secrets and truths at last emerge, she faces a moment of reckoning that will forever alter her destiny . . . and that of the New Republic. I love it so far, holds my interest and the narrator is really good! I would definitely recommend this to a friend! This book is up and down. It starts good, lulls in the middles and then picks up again. Leia and Han's business partners are a great addition to this story. The danger that the Solos intentionally put themselves in seems to go overboard in this novel. It just doesn't seem realistic. It's one thing if you happen upon the Imperials and have to improvise but to run in front of them waving your hands seems too stupid for them. A fun story that is easy to listen to because of the known and loved characters and terrain. The reality is that Han has always been a reluctant hero, but he always plays a part in "saving the day" and he does it again with his typical humor and brash style. 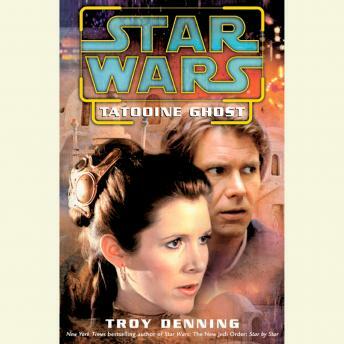 Leia finds out that her father and grandmother were well-loved and admired figures on Tattoine. She comes to terms with her genetic heritage and can finally have her own family with peace of mind.